Even though Edge of Tomorrow, or Live Die Repeat as it's been rebranded, didn't do well at the theatrical box office, it's thankfully found the audience it deserves on home video. The film starring Tom Cruise and Emily Blunt isn't just another sci-fi blockbuster as it takes the familiar Groundhog Day premise, delivers some killer action but also throws in a surprising amount of comedy. 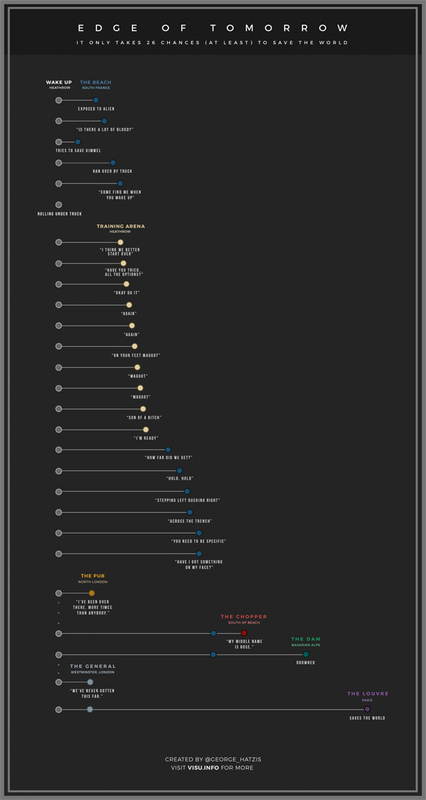 Now a fan of the film has decided to create an infographic charting every single time William Cage (Cruise) dies in the film. Keep in mind, these are only the deaths we see as much more time and deaths pass off camera. Look below now! Edge of Tomorrow is set in the distant future during war between a race of aliens called Mimics and the human race. A soldier fighting in a war with aliens finds himself caught in a time loop of his last day in the battle, though he becomes better skilled along the way. Tom Cruise plays Lt. Col. Bill Cage, an untrained and ill-equipped officer who is dropped "into what amounts to little more than a suicide mission," but gets stuck in a time loop on the same mission. Doug Liman (Go, Bourne Identity, Jumper) is directing. Warner Bros. released Edge of Tomorrow, now Live Die Repeat, in theaters and now it's available on Digital Download. I love this film. But we know he dies way more times than this infographic shows. Probably hundreds. Not to get too geeky, but you'd think in instances where they say something like, "never got this far" you have to count at least one instance before, so that raises the minimum count. That aside, I recall death scenes (besides the rolling under truck death), like on the battlefield running up to get Rose for the first time hit by that truck, battery pull death, save balls out guy death, and trying to get off the beach. Also, in the dunes looking at the trailer park, 'as far as we've been'. Seems like the list not only doesn't follow a reasonable rational to add the deaths, but is horribly incomplete.